The development of the 667BDR Delta III Kalmar (Squid) ballistic missile submarine began in 1972 at the Rubin Central Design Bureau for Marine Engineering. This strategic submarine is equipped with the D-9R launch system and 16 R-29R missiles, and is the first submarine that can fire any number of missiles in a single salvo. The R-29R missile is the first sea-based Soviet ballistic missile carrying 3 to 7 multiple independently targetable reentry vehicles (MIRVs), with a range of 6,500 to 8000 km, depending on the number of reentry vehicles. The Delta III is equipped with the "Almaz -BDR" battle management system ensuring firing of deep-water torpedos. The inertial navigational system "Tobol-BD" is of the Delta II was replaced with the "Tobol-M-1" system, and subsequently with the "Tobol-M-2". The Delta III is also equipped with the "Bumblebee" hydroacoustic navigational system to determinate its position through hydroacoustic buoys. Instead of the hydroacoustic system "Kerch" was used on the 667BD submarines, the Delta III uses the new "Rubikon" hydro-acoustic system. The advanced Delta III SSBN entered service in 1976, and by 1982 a total of fourteen submarines were commissioned. All of them were built at Severodvinsk. The operational lifetime of these submarines is estimated to be 20-25 years. The Delta III submarines which served in the Northern fleet formed a division and were based in the port of Sayda in the Yagyelnaya bay and in the Olyenya port. In the early 1990s the ballistic missile submarines were transferred to Yagyelnaya. The Delta III boats that served in the Pacific Fleet formed a division of SSBNs which is based on Kamchatka. When the START-1 treaty was signed in 1991 five 667BDR SSBNs still served in the Northern Fleet (3 - in Yagyelnaya, 2 - in Olyenyey) and nine in the Pacific Fleet. One Delta III submarine of the Northern fleet was decommissioned in 1994. The Nunn-Lugar Cooperative Threat Reduction program was scheduled to dismantle 25 Delta-class, five Typhoon-class, and one Yankee-class ballistic missile submarines capable of launching over 400 missiles with over 1,700 warheads, by the year 2003. As of September 1999 US specialists had helped disassemble one Yankee- and six Delta-class submarines, while the Russians had destroyed another five ballistic missile subs on their own using American equipment. As of June 2000 the Russian Navy claimed that it operated 26 strategic nuclear submarines carrying 2,272 nuclear warheads on 440 ballistic missiles. This force was said to consist of 5 Typhoon class submarines, 7 Delta-IV class submarines, and 13 Delta-III class submarines [which only added up to 25, not 26 submarines]. Not all of these submarines were seaworthy. The Russian Navy reportedly believed that 12 strategic nuclear submarines with ballistic missiles represent the minimum necessary force structure. According to media reports a classified presidential decree of 04 March 2000 established this force goal for the period through 2010. Dmitrov Dmitrov, 40 miles north of Moscow, is is site of Dmitrov-7 (Avtopoligon), one of the Soviet-era Science Cities (also known as Dmitrovskii avtopoligon). Noginsk The Noginsk test range, 70 km (44 miles) east of Moscow, launched the first soviet military missile with liquid fuel, designed by A.K. Polyanskiy, on 11 April 1937. Today the Institute of Problems of Chemical Physics, Russian Academy of Sciences, is located at Chernogolovka in the Noginsk Scientific Center. Podol'sk NPO Lutch is located Podolsk, Moscow region. This Institute developed the “Topaz-2”, a space thermionic nuclear power plant used on the Radar Ocean Reconnaissance Satellite [RORSAT]. Serpukhov Serpukhov, near Kurilovo in Kaluga oblast, is the site of the Serpukhov Military Institute of the Missile Troops. Serpukhov-15 is the facility from which the Soviet Union monitored its early-warning satellites. Voskresensk The Isayev Design Bureau has testing facilities at Voskresensk, Moscow Oblast. Zelenograd Zelenograd is the Russian Silicon Valley. The Scientific Production Association ELAS in Zelenograd is focused on remote sensing of the ocean from air and space platforms. Another submarine-related enterprise at Zelenograd is Micropribor NII [Scientific Research Institute]. The names of the units of this class are rather uncertain. Many Russian submarines bear the names of towns. As of January 1999 there were supposedly only eight D-IIIs left in the Pacific Fleet, but nine names were announced in July 1998: Dmitrov, Komsomol'sk-na-amur, Krasnogorsk, Noginsk, Podol'sk, Serpukhov, Sviatoy Georgiy Pobedonosets, Voskresensk, and Zelenograd. As of 1999 K-506 and K-129 were reported to be in reserve in the Pacific Fleet, while by 2001 these two units were reported to be in service in the Northern Fleet. The strategic missile submarine K-44 was named Ryazan on 10 February 1998. Since then, this town and its surrounding region have been sponsoring the submarine. It is this kind of sponsorship which has enabled the Russian fleet to survive over the last 10 years. On 12 July 2002 the Russian Navy launched an R-29R Volna rocket carrying a 146-kg IRDT-2 Demonstrator-2 spacecraft from the submarine K-44 Ryazan in the Barents Sea. The three-stage Volna is a submarine-launched ballistic missile built by the Makeev company (called SS-N-18 by NATO). In March 1993 the nuclear submarine Borisoglebsk collided with the nuclear submarine Graling of the US Navy. The USS Graling had been tracking the Borisoglebsk from a position 155-165 degrees to the left and from the distance of between eleven and thirteen kilometers. The Grailing lost contact with the Russian submarine when the latter changed course. To reacquire, she rushed to the location of contact loss with the velocity of eight to ten knots. As of April 2000 SSBN "Borisoglebsk" was commanded by Capt 1st Rank Nikolay YELEZOV. In April 2000 president-elect Vladimir Putin took part in the North fleet's Barents Sea exercise. He put to sea 05 April 2000 aboard the North fleet's Karelia SSBN. Putin watched the submerged Borisoglebsk SSBN 667 BDR [Delta III] class launch her RSM-50 ballistic missile. On 20 July 2001 the Russian Navy launched an R-29R Volna rocket carrying the Cosmos-1 solar sail spacecraft from the submarine Borisoglebsk [K-?] in the Barents Sea. On 18 September 2001 the K-223 Podolsk nuclear submarine of the Pacific Fleet successfully launched a RSM-54 Shtil ballistic missile from an underwater site in the Sea of Okhotsk. According to the combat training plan, the warhead reached the Chizha range on the Barents Sea shore on time. The sub crew under captain Oleg Slugin's command showed high skills while performing the mission said Igor Dygalo, second in command of the Russian Navy. On 02 September 2003 a submarine of Russia's Pacific fleet successfully test-fired an Intercontinental Ballistic Missile (ICBM), a navy spokesman said in Moscow. The projectile fitted with a dummy warhead was fired from the Podolsk nuclear-powered submarine in the Far Eastern sea of Okhotsk and hit its target in the northwestern Chizha testing range. On 04 March 2004 it was reported that K-433 Svyatoy Georgiy Pobedonosets [Saint George the Victorious] had returned to service. This would bring a total number of vessels of this class on active duty to seven. The decision to reactivate this ship may have been taken in response to persisent lack of progress on the Yuri Dolgoruky, the first unit of the new 935 Borei class. Or it may reflect a decision to retire one of the Delta IIIs currently in service. K-433 had entered active service in the Northern Fleet on 15 December 1980. On 28 April 1992, the submarine crossed the Arctic and reached Kamchatka, where it joined the Russian Pacific Fleet on 03 November 1993. K-433 spent 11 years, half of its lifetime, at the shipyard Zvezda. The boat was renamed by a Russian Orthodox priest on 15 July 1998 [other sources report the naming came on 15 September 1998]. It was slated to be dismantled in late 1990’s, but the Defence Ministry provided funds [in 2002-2003?] and the sub was quickly repaired and returned to service. K-433 is the Svyatoy Giorgiy Pobedonosets, but the Oscar class submarine K-512 is also named St.Georgy Pobeditel [Georgy the Winner]. The Russian battleship, Georgi Pobedonosets, (George the Victorious) was the fourth and last ship of the Ekaterina II class, designated as 'Barbette" ships. May 6th is celebrated in Russia as the day of Moscow’s patron: George the Victorious. 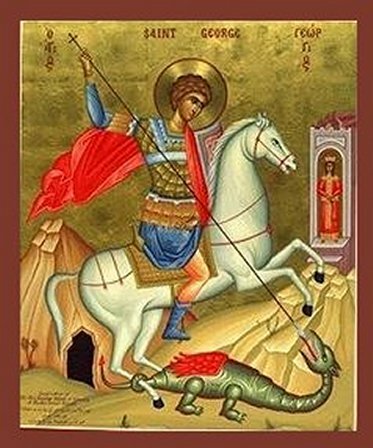 Another day, April 23, is also celebrated in honor of St. George. George was born to a noble family, had a spectacular military career, and earned a very high rank before the age of 30. George lived during the reign of emperor Diocletian, who started a persecution against Christians in the third century. George declared himself to be a Christian, and suffered great tortures as a result. According to tradition, Saint George the Victorious [Georgiy Pobyedonosets] saved the people of his hometown, the city of Berit (now Beirut), from the menace of a dragon [other versions of the story place the marshy swamp near the city of Silene, in the province of Libya]. The Dragon hid by the town spring, devoured everyone who went there for water. The residents and idolaters brought the dragon human sacrifices. When it became the turn of the king's daughter, George the Victorious appeared and struck the dragon with a spear. He did not kill it. Instead, he asked the Princess for her girdle, tied it round the creature-s neck, and the monster was led back in triumph to Silene. The 1981 movie Dragonslayer is very loosely based on this story. In Russia, St. George was considered a protector of Russian forces. The two-headed eagle and St. George slaying the dragon were the two major Russian political symbolic elements, predate Peter I [the Great]. The mounted dragon slayer known as George the Victorious was always associated with the Grand Duchy of Moscovy. Moscow has had the image of George the Victorious on its emblem since the XIV century, when this image was depicted on the emblem of the Russian empire. St George patron of knights, soldiers and kings. The Georgievsky Hall, the biggest and grandest in the Moscow Kremlin, is dedicated to the highest Russian military honor. The names of regiments, naval crews, batteries and more than 10,000 officers and generals awarded the Order of St. George the Victorious are engraved in gold on the marble plaques in the hall.